Forbes Lifestyle has learned exclusively that the Northwest Territories government has presented Prince William and wife Kate Middleton with a Harry Winston diamond brooch and pair of cufflinks. The gifts, bearing a pave polar bear silhouette beneath a semi-circle representing the northern lights, were given to the royal couple in a small ceremony earlier this afternoon while visiting Yellowknife, Northwest Territories (located in Northern Canada). 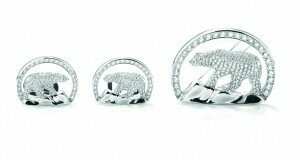 “It is an honor to provide these gifts that combine Harry Winston design and craftsmanship with the natural beauty of Northwest Territories diamonds,” said Robert Gannicott, Chairman and CEO of Harry Winston. Canada produces close to 10 percent of the world’s diamonds by value, trailing only Russia and Botswana. Canadian diamonds, a conflict-free alternative to gems mined in war zones, are largely brighter and glassier than African diamonds, explained Gannicott. The bejeweled souvenir issued to Prince William and Kate Middleton includes stones extracted from the Diavik Diamond Mine, a wide, circular geographic oddity situated on an island in the middle of a lake, just 140 miles south of the Arctic Circle. This year, the mine will produce nearly 7 million carats or $850 million in diamonds. The presentation was part of the couple’s nine-day trip through Canada, and the first official overseas tour since getting married in April. The royal pair will leave Canada Friday for a three-day excursion to California which will include a polo match in Santa Barbara and a British Academy of Film and Television Arts black-tie reception in Los Angeles. For more details on the royal wedding, click here.